You created a flawless product people are going to fall in love with no matter what. You are ready to launch and are completely certain your business is about to take off. There is no doubt in your mind customers are going to come knocking at your door. Next stop, Wall Street – IPO! Wait a second – just how are you going to get those customers? What is your growth strategy? How will you drive people to your product and make them aware it is available? Building your solution to these questions is how you achieve exciting growth! You are going to need to establish a sales team and equip them with a sales forecast to go out and attain. You will build out quotas, incentives, and formulate a model for how you expect your company to grow. Sales are a rigorous yet essential component to growing any business, and you need to make sure your team is as prepared as can be. There are many tools that can aid along the way, however one of the keys to ensuring your sales team meets your forecast is by outlining a clear Sales Pipeline for them to follow. In effect, a Sales Pipeline is a step-by-step process that your sales team follows from the point of initially generating a lead, to the moment of closing the actual sale. By understanding your sales pipeline and the ability to track potential buyers, you can accurately predict your revenue into the future. Without a clear pipeline and expected conversion rates, it becomes difficult to know how many people are likely to convert into customers today, next month, or over the next year. It turns out companies who define a formal sales process experience 18% higher revenue growth than companies that do not have a formal process in place. Given the option of higher revenue growth or not, one would think most companies would choose to have more revenue. Therefore it should be obvious that all businesses should spend time to diligently map out a sales pipeline. Let’s lay down some groundwork to get you thinking about yours. 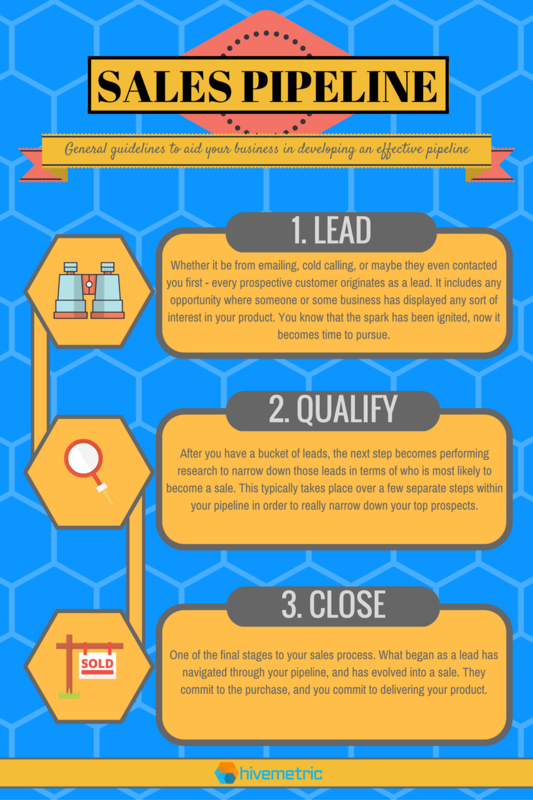 On a very basic level, a sales pipeline will traditionally include a few basic steps. We have created the infographic below to help get you started with yours. Please keep in mind that the steps listed above should not directly define your company’s specific sales pipeline. They are intended to provide you an outline to aid you in creating your own. While every business might have a different sales pipeline, their procedures tend to follow the same general path throughout the sales process. Most will include these 3 stages, but other pipelines may include additional steps that highlight specific points of handoff between different parts of your organization. An example that is very common is the classification of Marketing Qualified Leads (MQLs) and Sales Accepted Leads (SALs). You have laid out the steps for your pipeline. Now what are you supposed to do? Your next step is implementing your newly created sales pipeline to help plan a sales or revenue forecast for your business. I have to be honest with you – everyone who starts as a lead in your sales pipeline isn’t going turn into a sale. In fact, only 25% of leads have a legitimate chance of advancing to a sale – that means they only qualify as a potential sale, not that they will actually become one. This is exactly why you created your sales pipeline. An important aspect to your sales pipeline is in determining the probability of a lead making it through each step of your process. This, in turn, is the key to bringing your pipeline and forecast together in unity. It is also why your pipeline’s lead qualifying process is critical to accurately forecasting revenues. For example, what starts as a basic lead might only have an 50% chance of becoming a qualified lead after some initial background research. Of those, 25% will actually transpire into a sales qualified lead that is worth pursuing. Each stage will see fewer leads remaining in the pipeline, but the probability to close those existing leads should correspondingly increase. Therefore, understanding how leads traverse through your sales pipeline is exactly how you will develop, align, and analyze your revenue forecast. How do you go about displaying all of this? Combining your sales pipeline with your revenue model is no easy task, and surely no task that can be easily portrayed through something like a simple spreadsheet model, for example. An effective sales pipeline and forecast change as your business evolves, and you need a tool that can account for that type of constant modification. At Hivemetric, our integrated operational planning platform allows you to model your marketing and sales funnel to include revenue/expense assumptions for lead generation, qualification, and final deal closings. Fully incorporate your pipeline with tools that allow you to see how your current marketing and sales efforts are performing. Let Hivemetric help you understand when you need to modify your sales planning and spending to hit your required revenue targets. It is our goal at Hivemetric for you to carefully lay out each step in your business’s pipeline so that you can stop worrying about your framework and start focusing on closing the sale.